Well, it's our last day of My Creative Time's 5 Days of Christmas. I've gotten so much inspiration from Emma and the rest of the design team. I hope you have too! For my final project, I made something special for my niece Jane, who is in her first semester of college. 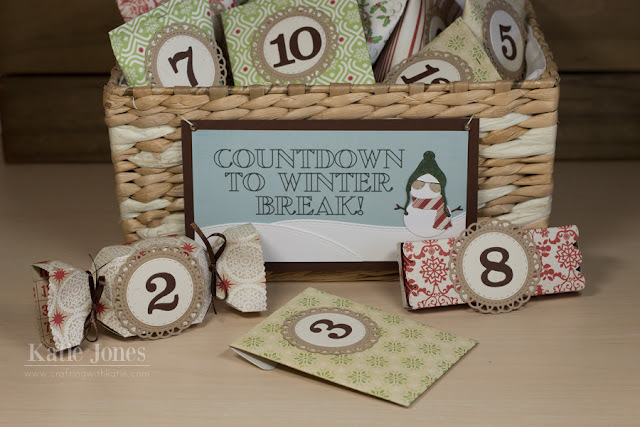 I thought it would be fun to make a twist on the Advent Calendar, a "Countdown to Winter Break" calendar! I found a cute basket at Joann's and attached a little sign I made to the front of it. I used my Cricut Explore with the Layered Monogram font to do the writing. Then I created some "snow," using the More Stitched Edges Dies. The cute little snowman was created with the Winter Snowman Dies. Jane has two roommates, plus another friend across the hall that they consider their fourth roommate. So, I needed to create treat boxes big enough to hold four treats in each! I made some sour cream containers, used the Bubblegum Treat Box Die, the Treat Slider Box, and even the Scallop Stitched Envelope Die, to hold gift cards for a few of the days! Each container is labeled with a number made with the Number Fun Dies + Add Ons, mounted on a tag made with one of the More Stitched Circle Dies and the Bunch of Stitched Doily Dies. Hopefully this little basket helps Jane and her friends get through finals! Emma will be giving away a $25 gift card to the My Creative Time store to one LUCKY commenter each day this week! All you have to do is leave your comments on each of our blogs, and Emma will announce the winner each morning on her blog! Good luck! Be sure to stop by Emma's blog to see more inspiration from her and the rest of the design team! OMG Miss Katie....WOW What a Spectacular goodie basket....your idea is brilliant. You are the bestest Aunt ever!! Your Niece and her friends are going to love it....talk about a way to spread the Holiday Cheer .... You nailed it!! Your Advent Basket ideas is Spectacular. Cute idea!! I am sure your niece and her friends will love it! Super cute project! I love seeing different ideas on Advent projects! Love it! 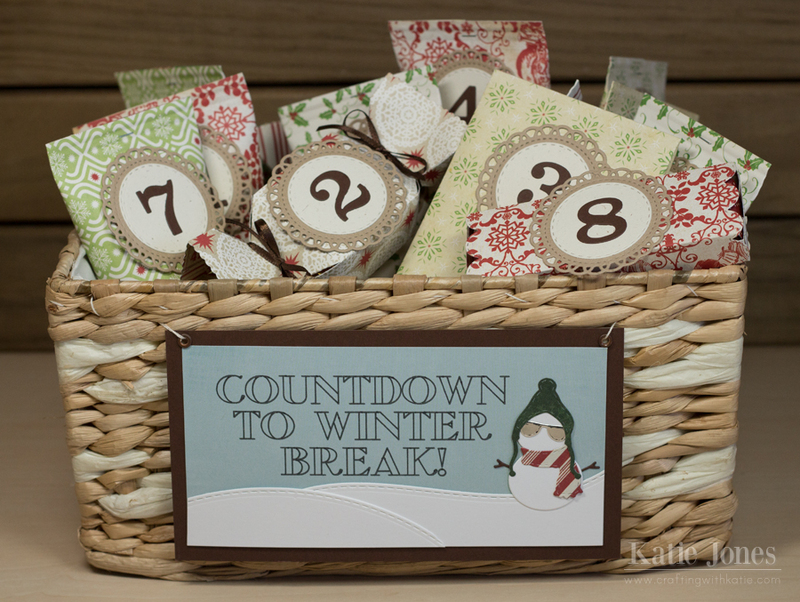 Your niece will love the countdown to winter break basket and gifts you so thoughtfully made for her. What a wonderful idea and fantastic project. Super cute treats! I love your little sign on the basket to..turned out just adorable! All the treats turned out fantastic! Fun patterns and fun details! I am sure your niece will love them! That is so CUTE and FUN! What a great idea to count down for Winter Break! I think I might just do that for my son instead of the advent calendar.... He's over Santa - so this would make it fun for him! :) Thanks for the inspiration! cool little treats and packages!!! I bet the kids love this. we use to open a stocking stuffer each day in the morning and the kids would do them the minute they woke up!!!! I miss it!!! Love your basket of countdown goodies! What a fun project! Cleaver project. I know my son is counting the days. Since he is a teenager I think he more interested in winter break than Christmas. Thanks for a great week of projects. Fabulous idea--I would have loved to receive this when I was in college. What a fun idea! I'm sure your niece and her roommates are going to love it! So cute and fun! I'm also loving how you used the doily die! That is a fantastic idea! Your niece is going to love that. This is such a fun craft project, wonderful job! What a fun countdown idea. What a great idea. Love your different designs. Ms. Katie, what a neat idea. I know your niece is going to love it.....who wouldn't. Great idea, thank you for all of your ideas and inspiration. Wow...what a clever idea! What fun Jane and her roommates will have with these fun treats. Your sign is adorable. Fabulous job!